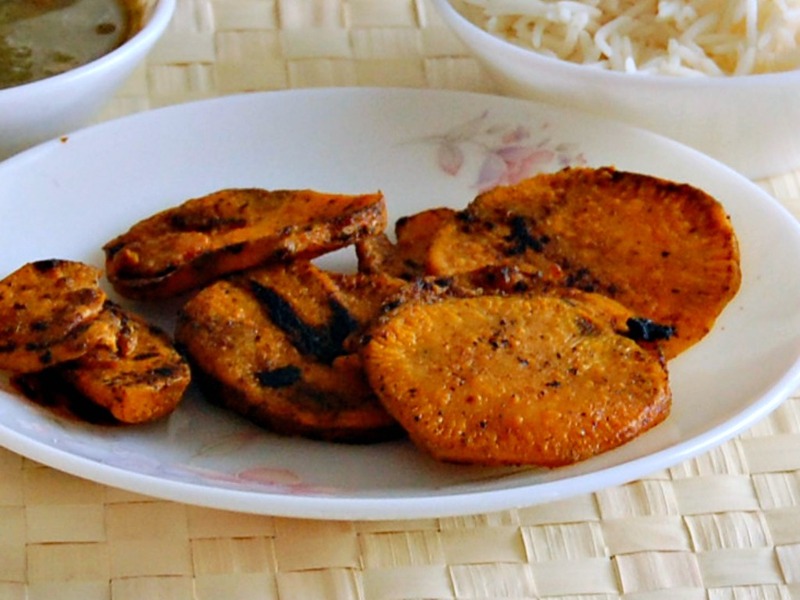 Elephant Yam, known as karanai kizhangu in Tamil, is one of my favorite vegetables and the best way to have it? Roasted on the griddle, like Fish steaks. Try as I might, I couldn't find fresh Elephant Yam in my local Indian Grocery store. The frozen variety comes pre-cut in small size and these are not suitable for roasting. I have learnt to substitute sweet potatoes in this recipe as they lend themselves well to golden perfection, when roasted on a cast iron griddle. Wash and peel sweet potato into 1/2 inch thick slices. In a steamer (or a pot of boiling water), steam the sweet potato until it is half done. You do not want it to be fork tender. The rest of the cooking will be done on the griddle. Drain and spread the sweet potato on a kitchen towel to dry. In a mixing bowl, mix turmeric powder, sambar powder, salt and lemon juice (if using). Add 1 tbsp olive oil and stir to make a thick paste. Heat a cast iron griddle on a medium heat. When ready, pour 1 tbsp of oil (or spray with PAM) and wait for it to get heated. Meanwhile, add the dried sweet potatoes a few at a time (about 6-7 pieces) to the bowl and coat it with the masala. Line a plate with paper towel and have it ready. Lay the pieces on the griddle, ensuring that these are not crowded and not touching each other. Cook for 3-5 minutes before flipping the slices over. Cook for another 2 minutes and remove to the lined plate.